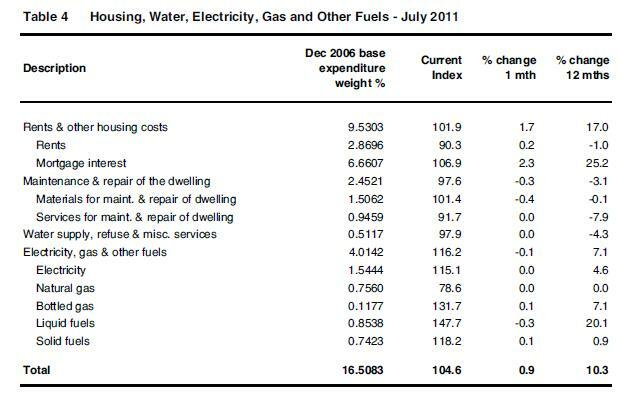 This morning Ireland’s Central Statistics Office (CSO) has released its inflation figures for July 2011. 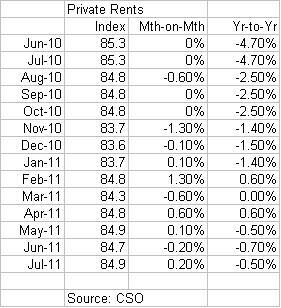 The headline Consumer Price Index (CPI) was flat month-on-month but up 2.7% year-on-year (same as the annual figure last month, in July 2010 the CPI also remained flat). The biggest driver of inflation in the past 12 months continues to be the CSO category of housing-related costs, and within that, the most significant component is mortgage interest* which has risen a staggering 25.2% in the past 12 months and indeed a significant 2.3% in the past month alone as ECB and domestic bank-driven interest rate rises take effect. Mortgage interest comprises nearly 7% of the CPI so the effect is significant. Elsewhere it seems that private rents continue to stabilise, though there was a small monthly rise of 0.2% in July 2011, and an annual drop of -0.5%. It seems that in our financial crisis, the big correction in rent took place in 2009 with a 19% maximum decline, compared to a decline of just 1.4% for all of 2010. Since the start of this year there has been a 1.6% increase (mostly recorded in February 2011). So on that basis, I think it fair to characterise rents as stabilising. There is a view however that rents are artificially elevated at present as a result of the social welfare rent assistance programme. Although it is the case that many properties that are advertised for rent will not accept rent-assistance claimants, it is arguable that landlords for these properties still reference their prices to rent assistance provided by the State, which by the standards of other countries, is seen as generous (the latest allowances are available here) Will rent assistance survive the budget cutting as we to deal with our deficit? Minister for Social Protection, Joan Burton, has signaled that rent assistance may be in the firing line for the December 2011 budget. We currently spend €500m annually on rent assistance.